This is a green laser pointer by Atlasnova, it's a class IIIa 5mW pointer legal to most countries laser regulations. The laser uses two AAA batteries, and produces green light at 532nm in the light spectrum. Since green is the color that the eyes see better it is a very very bright pointer and will be a huge difference with the red pointers in the same power range. This pointer can be used for sky-pointing in astronomy, it can also be used to point at distant objects, for signaling when hiking or doing outdoors activities and several other uses. It is probably too bright for presentations unless you are giving a night presentation with a giant screen. As with any laser even at 5mw you should not point the laser to other people and avoid direct contact with the eyes, remember that pointing to aircrafts or helicopters is not legal in many countries so don't do it. You can get it for $69 and read more in Atlasnova's website. 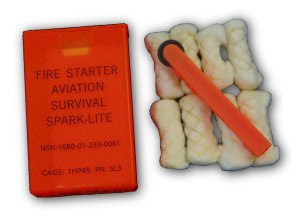 The spark-lite is a fire starting kit containing a spark generator, tinder and a plastic box to keep everything together. The spark generator is spark's lite star, smaller than a small pen the flint wheel will create thousands of sparks without any effort, it can be used thousands of times and will work under rain, wind and other adverse conditions. The tinder-quick has to be worked a little sepparating some filaments, it starts quickly and burns for more than 3 minutes, enough to start a fire under most normal circunstances. It usually takes 10 to 20 seconds to start a fire with this kit and you don't need any physical strength or special skill. If you are out of tinder-quick cotton balls covered in petrol jelly work fine and burn for 3 to 5 minutes. The kit is packed in a waterproof orange box that can keep 8 pieces of tinder-quick and the spark-lite. You can read more or order for about $10 from this site. 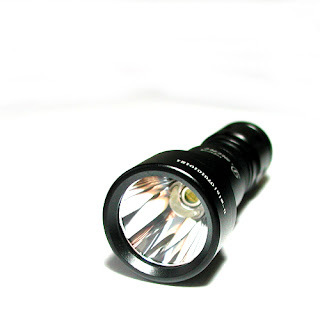 The D-Mini is a Cree XR-E led flashlight using a single C123 lithium battery. The Cree leds are the last advance in led illumination technology being brighter and more efficient than a Luxeon led. With the XR-E and a big deep mirror finish reflector the D-Mini can produce more than 100 lumen of light with just a single battery and run for about an hour. The flashlight can use either primaries or rechargeable batteries. The body is HA-II anodized aluminium with a black coating, resistant to impacts and water. The reflector is made of metal and the lens ismade of anti reflective coated glass. The beam is specially designed for throw, and indeed the D-mini will throw further than any other single cell flashlight due to the XR-E led and the big metal reflector, you can reach and light up objects that are very far away from you with this little light. Surprisingly the D-Mini will out-throw big incandescent expensive lights so it is probably an outstanding choice for outdoor activities. The switch is a reverse clickie and the light comes with another clickie lockout switch as an option, there is glow in the dark material in the tail to find the flashlight in the dark as long as it has been previously exposed to light. Along the extra switch the light comes with a belt sheath and a wrist lanyard. The sheath is made of nylon and is of good quality. Lumapower is now also offering a 2-stage switch for the D-Mini that will add a low brightness mode to the light for extended runtime. The mechanism is simple: off-low-high-off. This is an amazing little light an authentic throw monster in a very small flashlight, amazingly bright and built with quality. You can read more and order for $59 from Lumapower's website. For many knife enthusiasts the Mini-Skirmish is in the top ten of favourite knives and is probably one of the best small EDC knives you can get. The Mini-Skirmish is a pocketable folder, the blade length is 3.43'' the closed length is 4.30'' going up to 7.73'' when opened. The handles are made of Titanium so it's a very light knife that will resist corrosion, impacts, use and abuse. The titanium handles make the knife very light weighting only 3.92oz. The blade is made of S30V stainless steel, with a reverse curve shape. The lock is a titanium monolock mechanism very safe and easy to operate. Probably one of the best locking mechanisms in the market. To open the blade the mini-skirmish offers a series of stylish thumbholes that works effectively for one hand opening and gives the knife a modern look. The pocket clip can be used to clip the knife to a pocket tip-down. In short words the Mini-Skirmish is an excellent folder combining titanium handles and S30v blade with a superb locking mechanism. 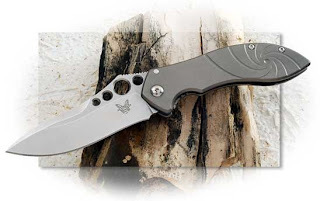 The cost is about $150, you can order from KnivesPlus and find more information in Benchmade's website. The zebra telescoping pen is a small and affordable pen that goes from about 5cm to 8cm when extended. To extend and collapse the pen you just push or pull, when expanded the pen is ready to write when collapsed the tip of the pen is covered so you can't write with the collapsed version. 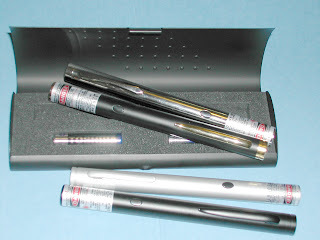 The pen is made in aluminium and uses common refills, it is compatible with Fisher Space Pen Universal refills (not the ones for the Fisher Bullet Pen). 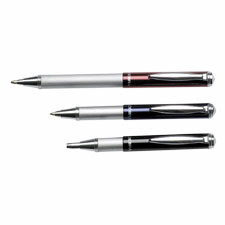 This pen has a pocket clip of good quality to clip the pen to pockets, wallets or a notepad, it does not have a small hole or attachment point for a splitring or a lanyard so it is not suitable for a keychain or neck carry. It writes fine with the normal refill and that can be improved changing to a Fisher refill as mentioned. The grip is very good and the pen is really nice to carry and use. Retailing for less then $5 in most supply stores and supermarkets the Zebra Telescoping Pen is a small and affordable pen for EDC carry. You can read more in Zebra's website.